Anique Taylor holds an MFA in Poetry from Drew University, and an MFA in Drawing from Pratt Institute as well as a Diplôme from Sorbonne University in Paris, France. She has co-authored works for HBO, Scholastic, Simon & Schuster, and others. She has given featured readings at St. Mark’s Poetry Project, Dixon Place, the Speakeasy, Cedar Tavern, and group readings at What Happens Next, Tompkin’s Square, Charas, and The Knitting Factory. Her writing has appeared or is forthcoming in Rattle, Common Ground Review, Stillwater Review, The World (St. Mark’s Poetry Project), Adanna, Cover Magazine, Cheap Review, Southern Poetry Review, Earth’s Daughters. She has published several chapbooks, including Where Space Bends, chosen Finalist by both Minerva Rising’s and Blue Light Press’ Chapbook Contests, and Under the Ice Moon, also a Finalist in the Blue Light Press Chapbook Contest. Anique has taught The Creative Journal at Bard LLI and the Poetry Workshop at the Benedictine’s Oncology Support Program. 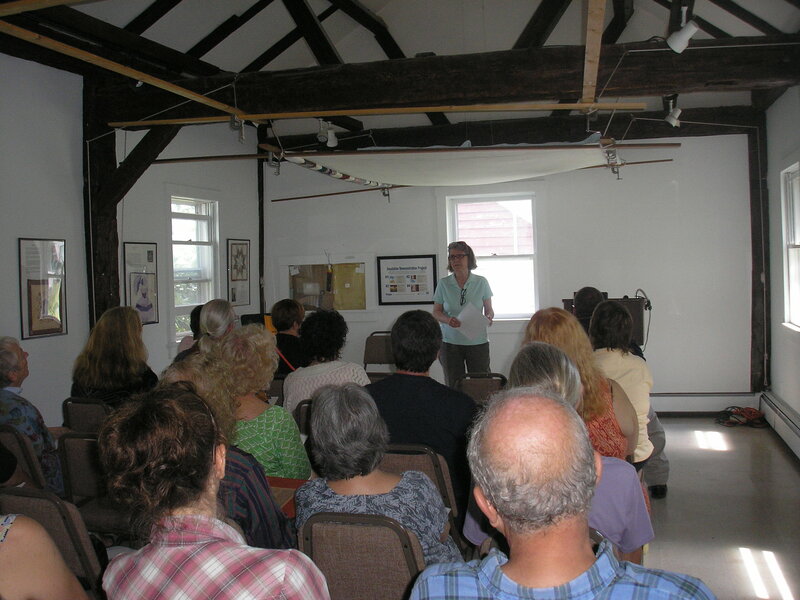 She teaches a Creative Nonfiction Workshop for Writers in the Mountains. Simona David: Anique, talk a little bit about yourself. Anique Taylor: I’ve been a visual artist most of my life. I’ve also written all my life, and have been involved in St. Mark’s Poetry Project in New York City, doing poetry readings for quite a while. A few years ago I re-committed myself to writing, and enrolled in a MFA program at Drew University, which has some of the most accomplished poets in the country. They’re deeply devoted, and have exquisite knowledge of craft. They opened up my whole life. 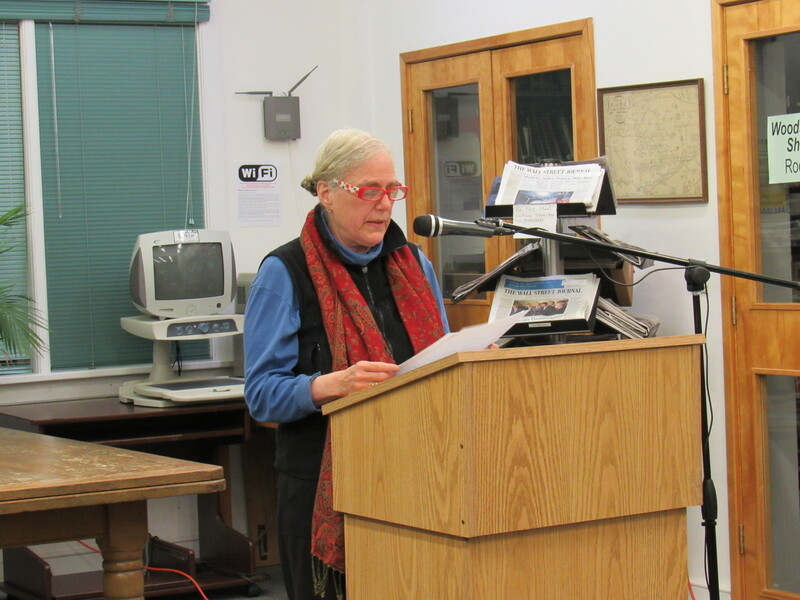 SD: You started a Poetry Reading series here in the Catskills, in the town of Phoenicia. AT: Yes. Phoenicia has a population of around two hundred. We started a marathon reading during the summer, and had about one hundred and thirty people on the lawn, sitting in lawn chairs. They sat for hours listening. It was wonderful. SD: You have been teaching for Writers in the Mountains, for quite a while now, a popular Creative Nonfiction Workshop. Let’s talk a bit about the genre of creative nonfiction. AT: I think we each come to writing however we can, and from wherever we can. For some it’s easy, for others it’s difficult. But most of us come to it because we have a desire, and the desire continues. Each time we write, we venture into the unknown, and it’s always a risk. I’ve been writing ever since I could write, and before that I used to write stories in my head. I didn’t consider myself a writer, because I didn’t make up stories. The real writers were the ones who made up stories. I liked to write about things that happened to me or around me, and the things that I felt and thought. When I studied poetry, that gave me tools to write better. Afterwards, I discovered that what I was writing all along is called creative nonfiction. SD: Lee Gutkind, who founded Creative Nonfiction magazine in 1993, defines the genre as “true stories well told.” How would you describe creative nonfiction? And what does it cover? AT: Creative nonfiction can be memoir, personal essay, journal, poetry, research papers; it can be almost anything. I’m working on a manuscript now of creative nonfiction poetry. It’s based on stories about non-Jews who risked their lives to rescue Jews during World War II. It’s poetry, it’s also creative nonfiction, because the poems are all crafted from true stories. Lee Gutkind also said that in some ways creative nonfiction is like jazz: it’s a rich mix of flavors, ideas and techniques, some of which are newly invented, and others are as old as writing itself. Creative nonfiction can use the tools of writing forms such as sound, diction, metaphor, rhythm, description, dialogue, even plot. When you write something that is true, you still need to decide how to frame it, where it begins, where it goes, what to put in, what to leave out. The art is to make it come alive, to make it matter. There are two parts: what you say, and how you say it. SD: What do you think makes this genre so popular? AT: I think people are fascinated with other people’s lives. There are so many possibilities – you can do anything you can think of in the world with creative nonfiction. SD: Biographies, for instance, have always been popular. Please, share some of the best names in creative nonfiction. 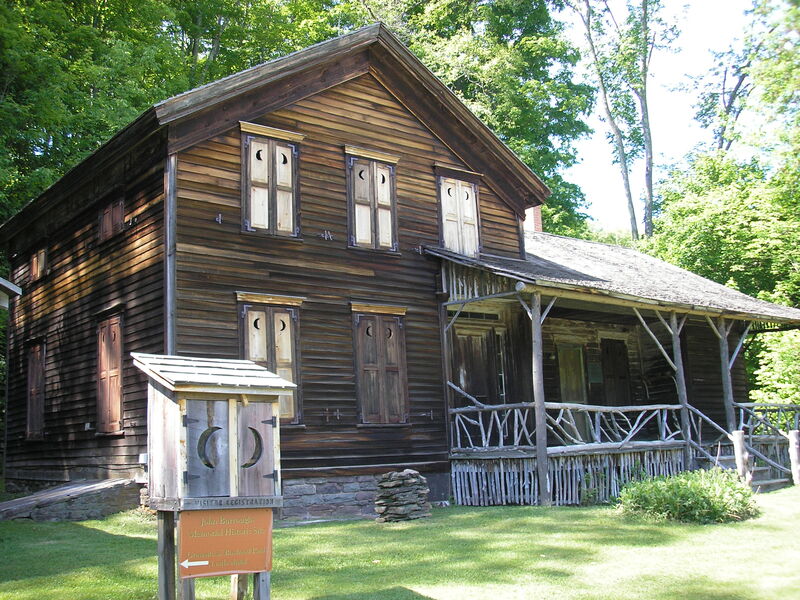 AT: There is Thoreau, who wrote Walden. That’s a memoir. A biography covers a whole life, a memoir covers a part of a life. Emerson’s essays are really wonderful. Kurt Vonnegut, Joan Didion – Didion’s work is exquisite; Anne Lamott, David Sedaris – very funny and popular. Virginia Wolf, Truman Capote, Susan Sontag, so many. What I find interesting is that it’s very usual for novelists and poets to also have essays or memoir pieces. SD: Let’s talk a bit about your approach to teaching creative nonfiction. I’m looking at a note you sent out to class at the beginning of the semester: “Write about love. Do not directly describe the person (animal companion, place, house, friend, group, etc.). Avoid emotional adjectives and adverbs. Let your nouns and verbs give substance to your writing. Let details, action, dialogue, description speak for your emotions. It doesn’t have to be about cozy, kissy love. It could be about unfulfilled love, loss, confusion, betrayal, the excitement of beginning love. See where it takes you. Have fun. Your work can be personal or shared with the class.” What is the structure of your class, and what are your goals as an educator? AT: What we do in class is that we start with a silent writing prompt. And everybody writes for about ten minutes. It’s work that they never have to show anyone. Then we usually have a discussion about the readings – I send out beforehand a few essays or a story piece. And we talk about the craft, we talk about what makes the piece work, what are the issues that the writer uses and are strong, what’s the structure. Then we listen to each other’s current work. I give a class exercise. In the end I assign homework. SD: One piece of advice you give your students is “Avoid clichés, and overused expressions.” And I often hear experienced writers say “write as you speak.” In other words, just be natural and authentic, and don’t strive to find the perfect phrase. AT: I think it’s very important, especially with the first draft, to just write and let everything come out. Don’t focus on trying to have a voice. Focus on speaking out as yourself. When you look at the piece a few days later, you will edit. Yes, on the one hand, be authentic; on the other hand, you want to take out phrases that weaken or slow the process and lose the reader. There are writers who write very simply and plainly, and that is riveting. And there are other writers who write in very complicated ways, dealing with very difficult, philosophical questions. SD: Absolutely. And each of this kind of writer has his or her own readership. AT: Exactly. And some of us love both. SD: You mentioned voice. On the first draft, you say, don’t focus too much on developing your voice. What is voice, and what is tone? AT: My advice is to write the first draft with passion, then come back when it’s cool, to be able to bring in the editor in you, and tighten things up. Your voice is who you are. We’ve also had long discussions in class about tone and viewpoint. Are we writing from the first person? Is it intimate? Are we talking to someone close to us? Is it a gentle tone, or angry or resentful? Is the first person omnipotent? You can write from the second person. The third person can be very familiar. It can also be an omnipotent third person. We take a piece and write it from various points of view. These are all tools that I want my students to have in their toolbox. SD: I know that at the beginning of your class, you ask your students to clarify their goals – why are they taking the class, and what do they seek to accomplish? You ask them to think about their strengths, and what they want to write about, their voice, and also what they think holds them back. Talk about this experience. AT: I want my students to become aware of what they had really wanted but never verbalized it before. SD: Let’s talk about writing a personal essay. You recommend a piece by Tim Bascom, Picturing the Personal Essay, A Visual Guide. How does diagramming an essay work? AT: Most people assume that, because it’s creative nonfiction, you just tell the story. But there are infinite possibilities in a way you tell a story. So, in class we started to diagram the structure of each essay, and that gave us a visual sense of how to form an essay. SD: I think this is helpful from the reader’s point of view too, because we’re all visual learners to some extent, and once we see a story in our head and the story makes sense to us, it’s easier to remember it as the time goes by. AT: Yes. As a writer however, I don’t think you start with a form in mind. I think, as a writer, you just have to let it go, and then come back to it later to see what you’ve gotten. SD: In essence, your advice is to focus first on what you have to say, then how you say it, and then look at the overall structure – the visual representation of your story. AT: Yes. The visual representation is something you would come to later to look at. It’s also important to read other people’s work to see what they do. SD: One last piece of advice for writers. AT: I constantly read, and do it as a research for class. What I look for are pieces that will inform us about how to write, and what choices to make when we write. I want a literary piece to be beautifully crafted. I care about what the writer is saying. I look for humor, wisdom, and scope. I want the writer to give us something that we can take with us, and will open us up, and change us. Amy Masters has been an artist all her life. Formally trained as a painter and printmaker, she pursued a degree in Interior Design at the Parsons School of Design, and worked as a draftsman for an engineering firm in New York City, before dedicating herself exclusively to painting and drawing. For over two decades, she taught in the New York City’s public school system, and spent her summers painting and drawing the world around. Moving to the Catskills in 2006, she was suddenly given far more space and limitless opportunities for inspiration. Amy likes to think about her work as being inspired by the natural world and the actual objects and vistas around her studios. But she likes to re-arrange and re-envision the landscape in the abstract. What is important to an abstract painter, says Amy, is the relationship between colors, lines and shapes, and the complexities of pattern and texture that emerge at the end of the process. 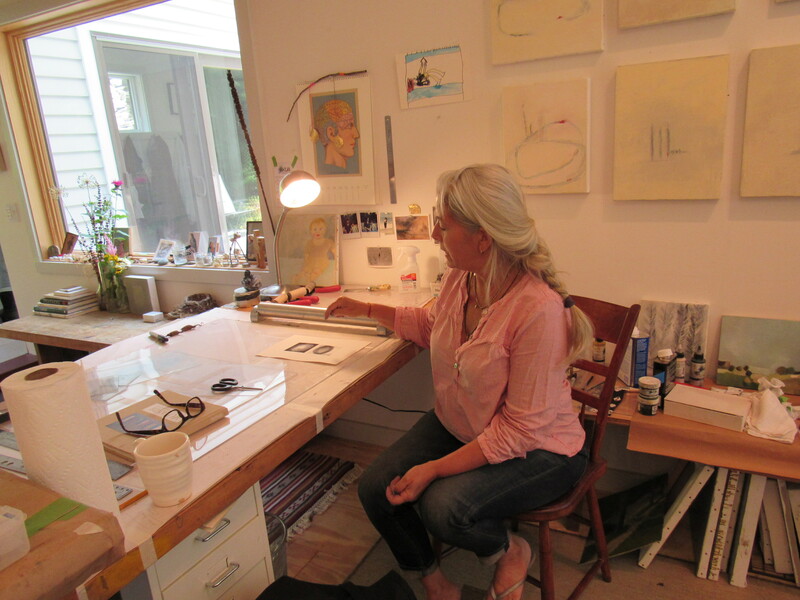 I spoke with Amy in her studio in Arkville, New York, earlier this summer. Simona David: Amy, let’s talk a bit about your training. Amy Masters: As an undergraduate student, I was a studio art major at Ohio State University in Athens, Ohio. I mostly studied painting and drawing. Then I wanted to come back to New York, and went to Sarah and Lawrence College in Westchester. I studied for about three years under Ansei Uchima, a phenomenal printmaker. And then I started my life, just working different jobs. I ended up working with my dad, who was an engineer. I worked as a draftsman, drawing plans – that was before computers. And then I went back to school and studied interior design. For a while I worked in an architecture firm, doing architectural design – I thought that was kind of a creative job. That’s where I met my husband, Ted Sheridan, who is an architect. All the while I was still painting; I had a couple of shows in the City. Fast forward, I went into teaching, and continued to paint, mostly throughout the summer, when I had time off from school. When I moved to the Catskills, ten years ago, I got all this space to work, and that’s when I feel like I got really serious about it. SD: Do you think that moving to the country has helped your career as an artist? AM: Absolutely. The environment informs my work. My work has always been about the place where I am. SD: I’m reading a book What is Art? by Leo Tolstoy. Ultimately Tolstoy defines art as the transmission of an emotion felt by the artist, and calls it an infectious phenomenon. What moves you, as an artist? AM: That changes. As an artist of course you’d like to think that your work has improved over time. You get better, just because you’re doing it: the muscles get stronger, you get more confident, the dexterity improves, everything. But going back to just what moves you, I think that has changed dramatically for me. The things that I’m drawn to now I wasn’t drawn to before. And I see things in other artworks that teach me something new or move me in some way I didn’t think possible. SD: Where do you start a new project? AM: That’s a really good question, because I do feel like I get onto something and I can’t stop. Sometimes it would be just the strangest thing. For instance, the feather print series – I don’t know where I first got the idea of this feather. There is something about the object itself, it’s very fluid. And I was thinking how unique, how individual each feather is, and that resonated with the process. Each time you make a print, it’s completely different. SD: Let’s take a closer look at this series. AM: There are different versions. Some are just monotypes, one-time prints, made with a soy based ink that I was experimenting with. I took a printmaking class in the City – an etching class, and had access to all sorts of equipment there, and began to explore what I could do with an etching. I made hard ground etchings where you just draw on a plate, and then etch it in a bath. 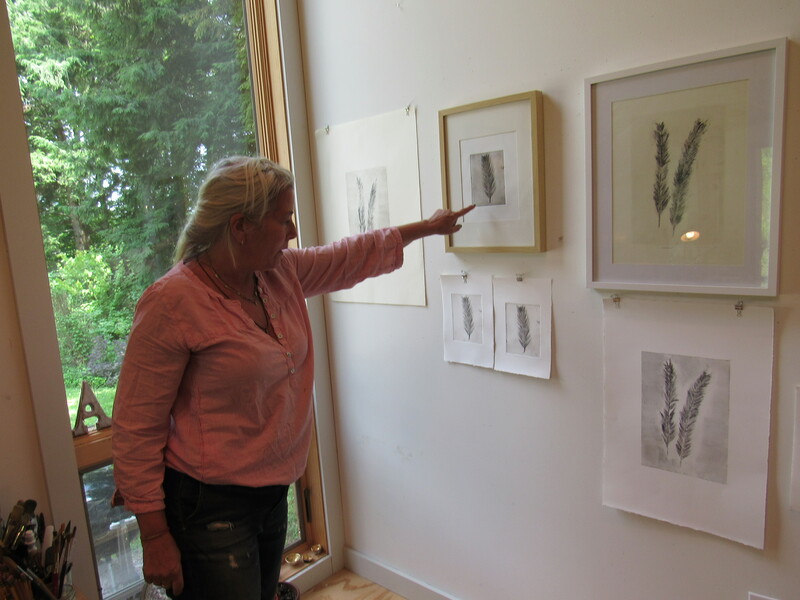 I’ve also made actual impressions of feathers: you lay the feather onto the copper plate, it picks up the image, and then you remove the object, and etch it, and that’s what you get. It’s an amazing process. SD: What kind of paper do you use? AM: Some are done on rice paper, others on printing paper. A lot of the etching is done on printing paper. SD: I see other types of prints in your collection. AM: I was doing etchings, and just couldn’t stop. And from there I thought, oh, I could do other botanicals. And the leafy quality of the feathers made me think of roots. So I started doing a root series. From there I don’t know how I got into these. AM: Yes. Keeping with the botanic idea, I started to do the nests. And inspired by the nests, I started doing a new kind of monotype: wiped monotypes. I would start with a plate full of ink; and then it’s more of a reductive process. I like these two images together. One reminded me of the sky at night – the galaxy; and the other one is a nest. 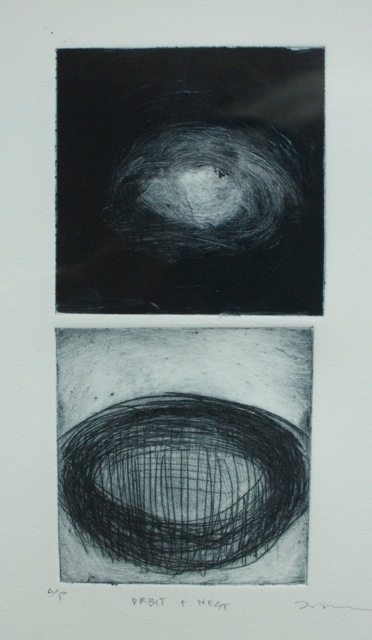 Orbit + Nest, monotype and drypoint, 3” x 6″. © Amy Masters. Contributed photo. SD: What an unexpected association! Especially if you see them from a distance. AM: Yes, I like that. From doing these, I got into this wiping process. I use a reverse surface roll. With an etching you push the ink into the etch line. With the surface roll, it’s reverse: it’s like a relief process, when you’re just keeping the ink on the surface, and you don’t want it to go into the etch line. It’s tricky. But you get a different kind of image. It’s interesting to try it a couple of different ways. For the past year or so I’ve only been doing prints – learning the medium, and the limitations of it. 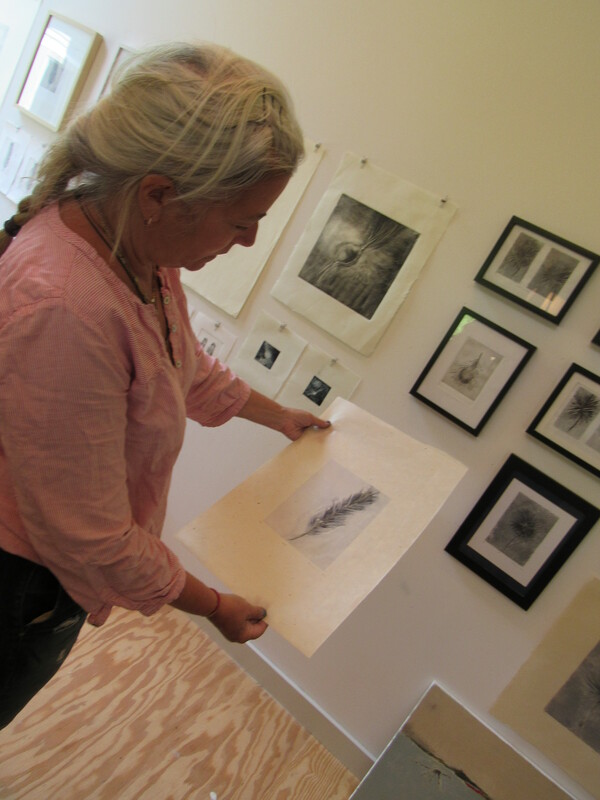 With printmaking there really aren’t any limits: you can do tremendous things. SD: Let’s talk about your paintings. You’ve been a painter your entire life. Abstract painter. I know that your approach has changed over time, especially after moving to the country. How about your color palette? AM: My palette changes a lot. I get into a color palette, and I work on it until I feel like I exhausted all the possibilities. Late last summer I did a series of white paintings. I don’t know how I got into this subtle palette, but I just wanted things to be very peaceful. I was looking for a way to convey that. I like to use a little bit of red, because it makes everything else look so much calmer. Generally, I like a limited palette. One reason I’m attracted to prints is their limited palette. Then you have to think about other things like the image, and the composition. Pond, oil on linen 11″ x 14″. © Amy Masters. Contributed photo. SD: What do these paintings represent? AM: These are trees. It’s the landscape. Landscape, oil on linen , 11″ x 14″. © Amy Masters. Contributed photo. SD: I’m just wondering how you name your paintings. As an abstract painter, if you name your paintings in a fashion that doesn’t really give people any hint of what they’re looking at, I imagine it makes the whole experience more intriguing. AM: The naming of work is a really curious thing to me. Sometimes it’s very obvious, other times more mysterious. For instance, some of the feather work I’ve done began to look very fossil-like to me. I began to name them “Fossil I,” Fossil II,” etc. They kind of look like something that was left in a stone. SD: Let’s talk a bit about the artistic process. AM: It’s always an idea that I start with. For instance, there is this orchard on the Thruway. In the winter all the trees look like big hands, and fingers. I wanted to pursue that idea for a while: the idea of these finger-like trees. I got distracted by printmaking, and were put aside for now. SD: How do you know when a painting is done? AM: It’s such an elusive thing. I guess when there is nothing more you can bring to it. You don’t want to overwork it. SD: Talk about your transition to country life. AM: I really struggled in the City. We have a very small apartment, so it’s very hard to set up things. I had periods when I had a lot of materials in the studio, and painted a lot. Printing, on the other hand, is very portable, I would just bring it back and forth with me. I could print all winter in the City. 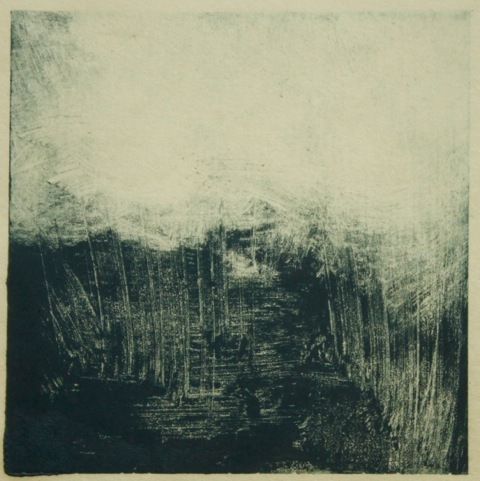 Indigo Pond, monotype, 3″ x 3″. © Amy Masters. Contributed photo. SD: How has your daily routine changed after moving to the country? AM: In the past few years it’s become really important to spend a few hours daily in the studio. Even if I’m not producing a new piece of work, it’s really important that I commit to spending time in the studio. I could be cleaning, or doing research, or just doing anything to be in this space. I like a book called Rituals – it’s about artists’ daily routines. It maps out what everybody does. For instance, some writers would take walks and think. I like to get up early, and garden for a bit, and then come in the studio and work six – seven hours. I try to get a swim in there, if I can. SD: Who are your influences? AM: I love Turner. Bonnard was an early influence of mine, for his colors. I like Morandi, an Italian painter of the early 20th century. Morandi is a painter who uses a very limited palette. I adore his still life bottles. You can really feel the artist’s presence in all his work. SD: Looking back at all the work you’ve done as a painter and printmaker, is there any piece in particular that you can call your favorite work? AM: It’s a painting called “Rocks in the Pool.” It was painted on an island in Maine. I think it’s my favorite, because it’s me – I think this painting really is me as a painter. The colors reflect what I was seeing. It’s a magical place that I like to remember. I struggled a bit, because I’m not a realist painter. But I just wanted to paint what I was seeing. SD: What’s your next project? AM: I think I’ll do more beet roots. To learn more about Amy, visit her website at http://www.amymasters.com/. Molly Rausch is a stamp artist. Her work has been exhibited throughout the Hudson Valley, New York City, Washington DC, Los Angeles, San Francisco, Barcelona, Oaxaca (Mexico), and Prilep (Macedonia), and is in numerous private and public collections. 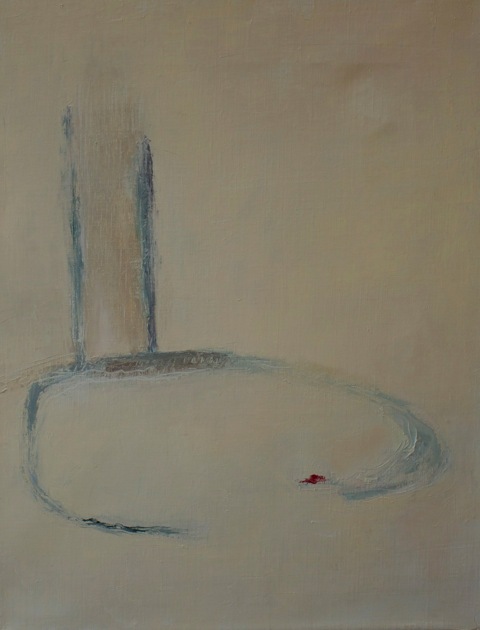 Molly’s work often deals with themes of communication and thresholds. She has participated in several public art projects, including a Lost and Found Drawing Booth in 2009. Her first museum exhibition was at the Museo de Filatelia in Oaxaca, Mexico in 2014. In 2015 she participated in the 58th Annual Contemporary Art Colony in Prilep, Macedonia: Molly’s work will be featured on an official Macedonian postage stamp in 2016. 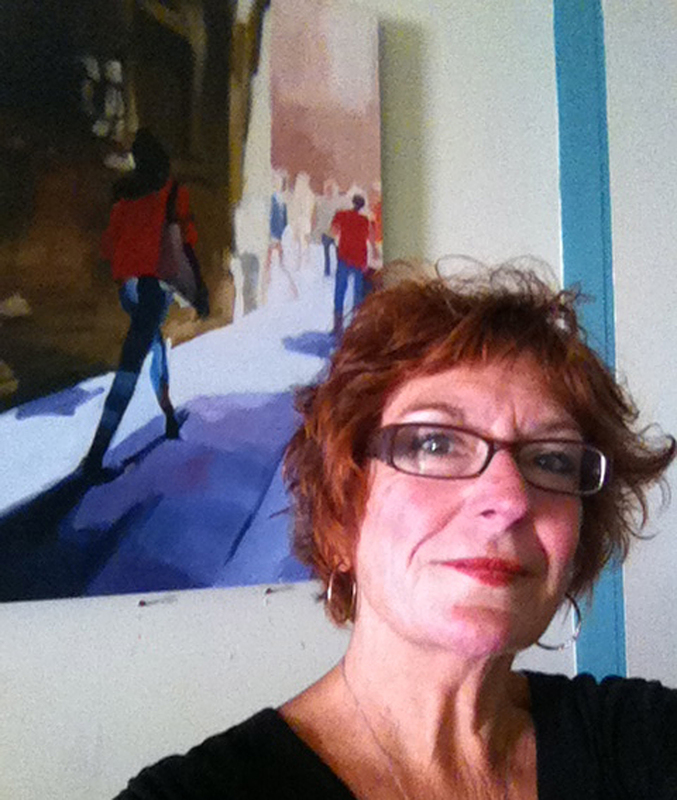 Molly holds an MFA in Painting from SUNY New Paltz, and a BA from St. Mary’s College in Maryland. She grew up in Maryland. 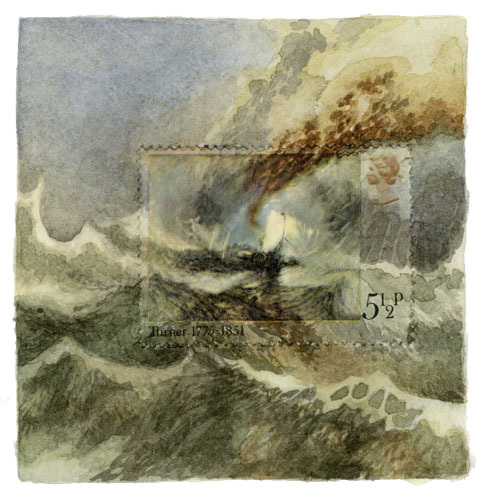 Turner Ship, 2 3/4″ x 2 5/8″, watercolor, gouache, postage stamp, 2015 by Molly Rausch. © Molly Rausch. Contributed Photo. Molly Rausch: It’s a tough question, because I don’t really know how does one become anything. But I’ve always loved drawing. I have three sisters, and we’re all about two years apart, so we’re a little bit of a competitive family. I remember when my oldest sister was given some oil pastels – they were given to her because she was considered the artist of the family. I remember I was very upset, I thought that was unfair. The only reason she was drawing better than me at the time was that she was four years older. And I really wanted to have those pastels. I think that you find what you love to do, and that’s what you end up doing. SD: I believe Picasso said that all children are artists, the question is how to remain an artist once you grow up. Are your parents artists? MR: My mom draws, and my dad is a wood worker, but they aren’t visual artists. My father is a doctor, and my mother is a teacher. But to answer your question, how does one remain an artist once one grows up, for me it was about establishing a studio practice when I studied art in school. How do you continue to make art? What are your requirements? How do you like to work? SD: You have formal training as an artist. What does it mean to be formally trained as an artist? And do you have any mentors or influencers? MR: As an undergraduate I majored in studio art. The art classes were the hardest, and that’s where I felt I was learning the most. As a graduate student at SUNY New Paltz I had some amazing art teachers. It was important to have concentrated time to work in the studio. Literally it’s just a practice: you go in, and practice, and figure out what your practice is going to be like. I remember seeing a Jacob Lawrence exhibition in college, and that’s what made me work in gouache. Otherwise, it’s just a slow evolution. I usually work in series, and one series leads to the next. It’s one step at a time. 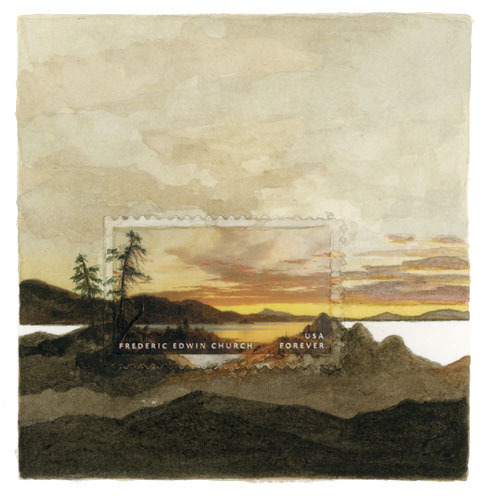 The Oldest Story In The World, 3″ x 3 3/8″, watercolor, gouache, postage stamp, 2015 by Molly Rausch. © Molly Rausch. Contributed Photo. SD: Do you always work from memory, or from photography, or with the subject matter in front of you? MR: I don’t like working from photography, I draw from observation. I like to see what happens when you try to depict things from observation and memory, and remember all the changes that happen. I have two main threads in my work right now: the postage stamp paintings, and a larger series of oils on plywood. For the postage stamp paintings I am using stamps as reference, but for the oil series I am working from observation. SD: You are working both on very small works like the stamp paintings, and large ones like the oil paintings. It seems to me that it takes two different sets of skills to work on small and large scale. What do you think? MR: I like having both threads going, and bounce back and forth between the two. Qbert, 3 1/8″ x 2 7/8″, watercolor, gouache, postage stamp, 2015 by Molly Rausch. © Molly Rausch. Contributed Photo. SD: From the viewer’s perspective is different too: these are two very different kinds of experience. 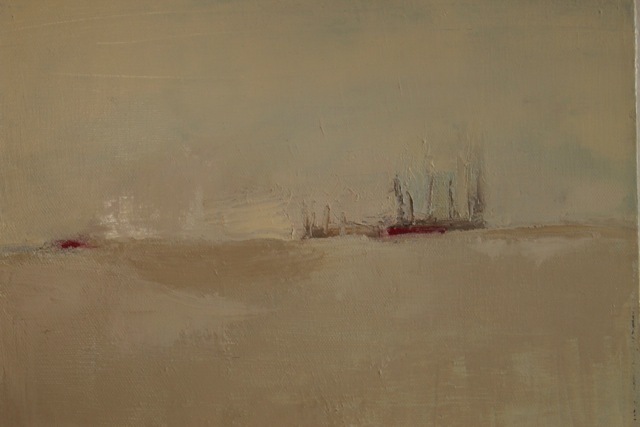 I have the feeling that I see more details in small works. MR: When it comes to the postage stamp paintings, I really like having that intimacy, I like having something small that’s going to make someone walk up to the wall and get very close to see what’s going on. It changes the way one relates to the artwork. When it comes to a small piece of art, you can relate to it as if it were a book: you can pick it up and hold it in your hands. You’re going to relate in a completely different way to a large oil painting. You step further away. And it’s different when it comes to painting it as well. My large work is very simplified. When you think that something is bigger, you’d think there is more information on it. SD: Let’s talk about the artistic process: how do you start a new project? MR: I work in series. I’m usually inspired by some new material that I’m introduced to. I have the material, and I have a problem to solve: how am I going to use this material? I play around with it until I hit on something. I get excited, and I create a series. Maybe I have twenty – thirty pieces, and then it feels like it’s done, and I don’t feel like I’m learning anything new from it anymore. Then I look for new inspiration and some new material to work with. SD: Now let’s talk about your postage stamp art. What triggered your interest in mail art? MR: The postage stamp paintings started with a bookbinding project. 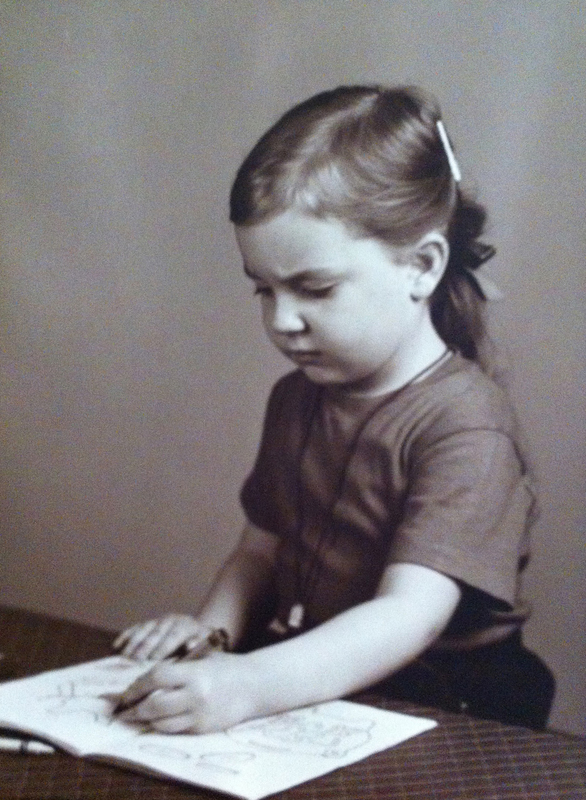 In 1997 – 1998 I took a bookbinding class. I was working on this very tiny book about 3 inch square. I didn’t know what to put in it. And it sat empty for a year or so, and then I finally started to draw on it, and I messed up my drawing on my first page. I needed something to cover it up. 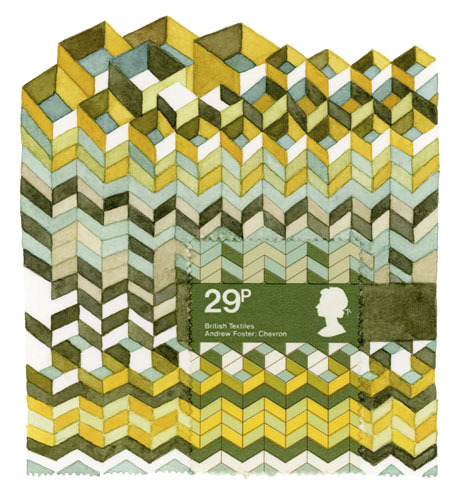 And I had this envelope full of old letters and stamps that my dad had given me – my dad used to collect stamps. They were all early 1900s, very beautiful. And because they happened to be the right size, I glued a stamp down on this little book to cover my bad drawing, and it just looked really nice in there. Then I glued another one on the next page, but this one looked like it needed a little bit more space on one side of it. The composition of the stamp was too symmetrical for me, so I glued it down and extended the horizon a little bit. The next page I thought that it needed some sky, so I added a little bit of sky. You can look through this book, and see the ideas grow from there. By the fifth page I thought I might be into something. That led me to drawing up maps on pieces of plywood. I did a whole series of paintings on that. Those were large, like 3 by 4 feet. 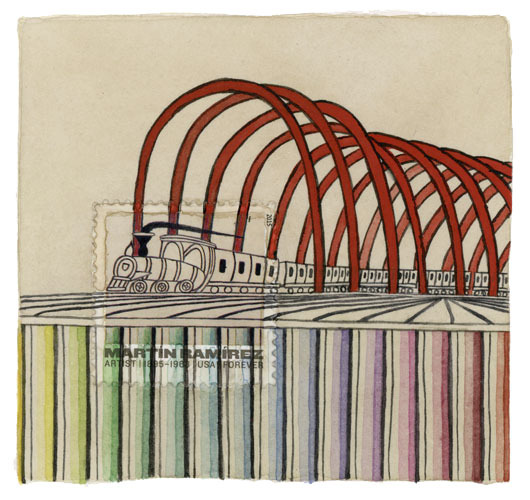 Ramirez Train, 3 1/8″ x 3 3/8″, watercolor, gouache, postage stamp, 2015 by Molly Rausch. © Molly Rausch. Contributed Photo. SD: Were you familiar at the time with other stamp artists? I believe this movement was started by the Dadaists in the 1920s. You did explain how you make your stamp art: you start with a stamp, then you build around it, and you imagine a world outside that stamp, as if the stamp was larger, and included a larger scene. MR: Yes. I glue down the stamp and I basically just paint around it. I don’t paint on it, and I don’t research it. I just stare at it for a while, and figure out the edges: I figure out what needs to go in the final composition. As far as the content goes, I feel like it’s already there for me, like I’m following the cues that are in the original work from the original artist. I work in watercolor and gouache. And, all my postage stamp paintings are actually about 3 by 3 inches, they’re very small. If you make them too big, then the illusion disappears. Right now as small as they are, there is a moment when people are looking at them, and actually they look at a few in a row, and then suddenly I hear them say “oh, there is a stamp in there.” It takes them a little bit to see it, and then they go back, and they go around the room, and say “oh, there is a stamp in everyone of them.” I really like that moment of discovery. 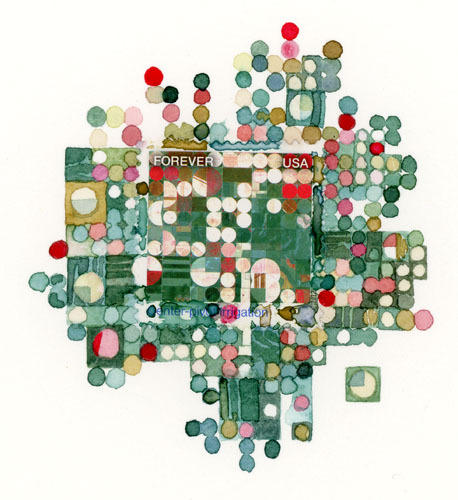 Mister Durand, 3 1/8″ x 3″, watercolor, gouache, postage stamp, 2015 by Molly Rausch. © Molly Rausch. Contributed Photo. SD: What amazes me about your work is the color palette that you use: you manage to stay on the same color palette that’s on the original stamp, and the brushstroke is also similar to the stamp as if it was done by the same artist. MR: I feel like the mockingbird of watercolors. I get to play with different styles. I am trying to match the style and the color of the stamp; people often ask me how I match the color. SD: Just to clarify: each of these postage stamp paintings is unique: you don’t reproduce and you don’t make any prints. Is that right? SD: Do you name these postage stamp paintings? MR: Some of them have titles. There was a series I did on currencies, and those had titles. Sometimes the title is important. But for the most part the titles that I make up are just descriptions of the subject, for example French castles. 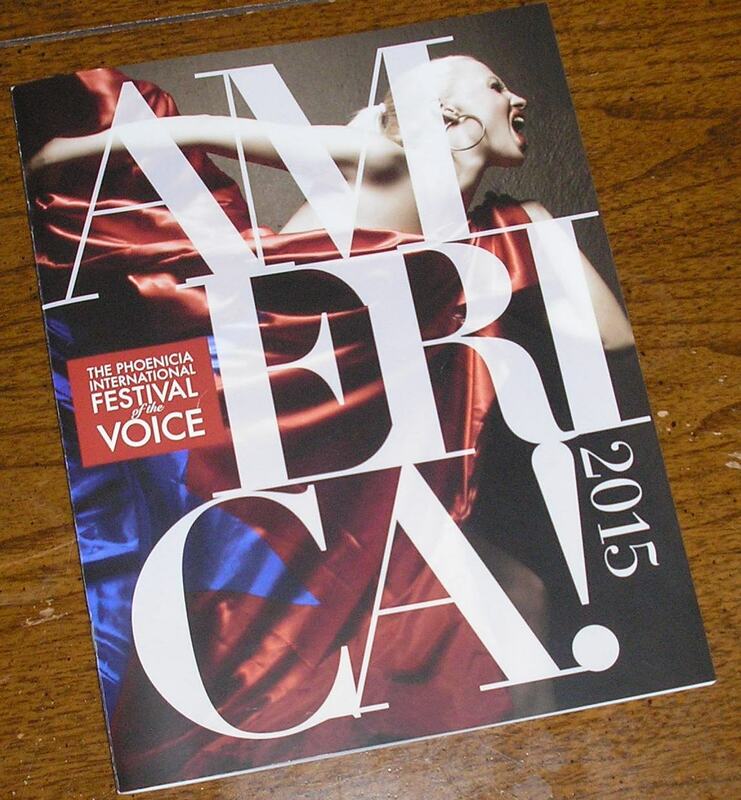 SD: You currently have a show on view at the Woodstock Artists Association and Museum (WAAM). What is included in this exhibition? MR: There are twenty-nine paintings, about half of them painted this year. This is a series of postage stamp paintings that I started eighteen years ago. There is a stamp by Frederic Edwin Church for instance that I used in three different paintings, so it’s like a mini-series of paintings each of them less and less finished. I think of them as frames in some unknown film. This was the first time I had the same stamp on more than one painting. And I liked the idea of working in groups. There is also in there a series about currencies. This show will remain on view through January 3. 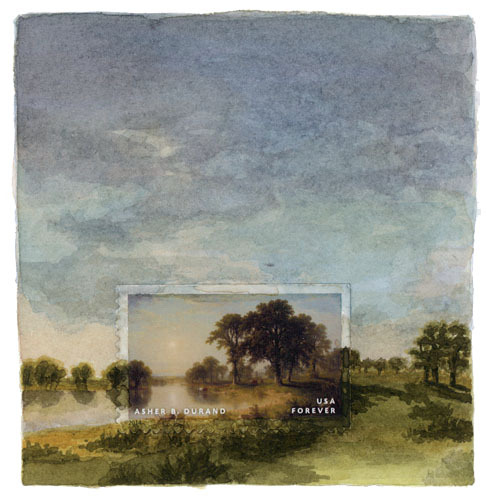 Hudson River Church School 3, 3 x 3″, watercolor, gouache, postage stamp, 2015 by Molly Rausch. © Molly Rausch. Contributed Photo. SD: You do other kind of work. You also work with typewriters. Let’s talk about that. MR: I started this series of altered typewriter sculptures five or six years ago. It started with a joke: I was at work, and trying to write an email for some client that I was struggling with, and I made a joke to my co-workers like “I can’t find the sarcasm key on this computer.” At that point I had two typewriters – I still use the typewriter. So I started making these sculptures: take the keys off the typewriter, take all the letters off the keys, put other things in place, then put the typewriter back together. The first thing I made was a typewriter with all the letters blank except for the ones in the very middle where the letters “g” and “h” would be, and just says “yes” and “no.” Sometimes you just want to simplify things, and make them that binary, you just need an answer “yes” or “no.” There is a typewriter I made where all the keys say “me,” “me,” “me.” We’re all guilty of this sometimes. I made another typewriter where I took the “Shift” key off it, and made it “Sarcasm” key. The typewriters are fully functional – I didn’t actually alter the striking key: it doesn’t actually type “yes,” or “no,” or “me.” They still do what they’re supposed to do, they still type the regular alphabet, which is important to me conceptually, because I’m interested in this illusion we have about communication, and how you think you can only talk about one thing, you think you can only say “yes” or “no,” but in reality you could actually say whatever you want to. To me typewriters are beautiful, not just as mechanical objects, but I love the alphabet and the fact that twenty-six letters can be re-arranged to say anything and everything. SD: What you said made me think of Marshall McLuhan’s famous assertion that “the medium is the message.” You like to write using either a pen, or a typewriter, or a computer. Does each of this medium trigger a different choice of words or perhaps a different thought process? MR: It’s completely different. There is no editing when it comes to typewriters. I feel like the typewriter is the purist because on a computer I can edit everything, whereas with the typewriter I need more stream of consciousness. With the typewriter whatever comes out in whatever order is what it is, that’s it. Just like talking live on the radio. SD: You’ve shown your work in many exhibitions throughout North America and Europe. What do these shows mean to you? Earlier this year you participated in an arts residency in Macedonia. What was your experience like? What did you learn? MR: It’s always a thrill, it’s always an honor. It’s nice to get things out of my studio, and have other people see them. The opportunity to travel to go to Macedonia this year was amazing. SD: Talk a little bit about what it means to get ready for a new show. 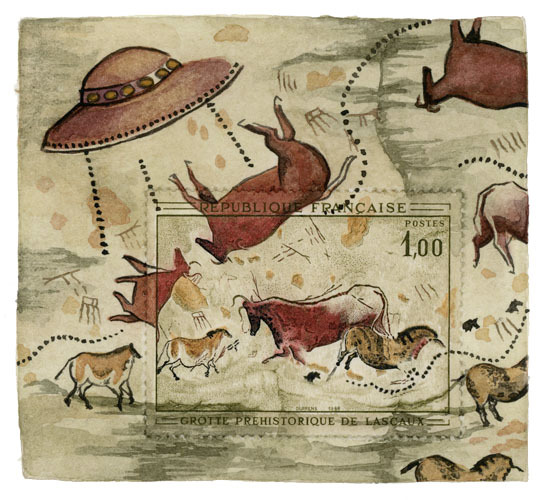 Crop Circles, 3″ x 2 3/4″, watercolor, gouache, postage stamp, 2015 by Molly Rausch. © Molly Rausch. Contributed Photo. MR: I’m working on a project trying to combine chalk board painting with concrete and piano roll paper. I’m working on a series of larger paintings on plywood that incorporate these three materials. I also have an exhibition coming up next year in New Haven, Connecticut, and I’m working on postage stamp paintings for them. I might include typewriters in this show as well, because the show will be hosted at the Library Institute, a beautiful, old library in New Haven. I’m imaging the postage stamp paintings on the walls and the typewriters set in the middle of the room. You can find more about Molly Rausch at http://www.mollyrausch.com. You can find more about Molly’s postage stamp paintings at http://postagestamppaintings.com/about/. All photographs were contributed by the artist. Brian Tolle has exhibited his work in galleries, museums, and public spaces around the world. His projects include Skid Rows for the Queens Museum (2005), Witch Catcher at City Hall, New York City (2003), The Irish Hunger Memorial in Battery Park City, New York (2002), Waylay for the Whitney Biennial and the Public Art Fund in Central Park (2002), Man’s Achievement on a Shrinking Globe in an Expanding Universe for Crossing the Line, Queens Museum of Art, New York (2001), and Eureka for Over the Edges in Ghent, Belgium (2000), as well as more recent projects such as Outflow in Calgary, Canada (2015), and Origin at the University of Houston in Texas (2015). Brian’s work emphasizes a formal and iconographic dialog with history and context to produce striking and subtle works that engage the public. Using a variety of media, his works draw themes from the scale and experience of their surroundings, provoking a re-reading by cross-wiring reality and fiction. Brian received his MFA from Yale University, BFA from Parsons School of Design, and his BA from SUNY at Albany. He is currently on the graduate faculty at Parsons School of Design, and is the recipient of the Art Commission of the City of New York Award for Excellence in Design in 2008; the Irish American Historical Society, Irish American Heritage Committee – Irishman of the Year in 2003, and the Louis Comfort Tiffany Foundation Award, also in 2003. He is represented by CRG Gallery in New York City. Brian has a studio in the Catskills, in the historic town of Roxbury, Delaware County. Simona David: Brian, before we talk specifically about your medium, please tell me how you became an artist. Brian Tolle: I was born in New York City, and my family moved out to Long Island when I was about five years old. I actually came from a political family. My grandmother was a very active Democrat, and was involved with a number of organizations. She had many grandchildren, none of whom were interested at all in politics. I was in a position in my life when I wasn’t really sure what I wanted to do at 18, and going to college. So I went to SUNY Albany, and eventually ended up working full-time as a legislative intern in my junior year. I worked for an Assemblyman from Queens. And it was very challenging, and a very interesting job, but very, very stressful as well, so I would go home in the evenings, and I would draw to decompress from a day that I had just spent working in the Legislature. By the time I finished at SUNY, I was fairly disenchanted with politics, and didn’t want to go further. I moved to New York City, and continued to draw as a passion, and paint and eventually people started to pay attention to what I was doing. I decided to go back to school at Parsons, and pursue a fine arts degree. Immediately after that I was lucky enough to be accepted into all the graduate programs that I applied to, and decided to go to Yale University, where I did my MFA. And I was fortunate once again to be recognized by one of my professors who made some connections for me in New York, and placed me in what was back then a new gallery Basilico Fine Arts. Soon after I graduated I exhibited in New York, I guess in 1995. After that I had a two men show at Artists Space, a non-profit space that continues to exist today. So, it was late coming to it, but once I got there, I hit the ground running. SD: It’s interesting that you have a degree in Political Science, but decided to shift careers, and become an artist. Did you draw or paint as a child? BT: I did, I even remember these little sculptures that I was making; and it wasn’t that my family wasn’t supportive – my dad always took us to museums and historic places, but if you don’t come from an artistic family, it’s not apparent necessarily how one might pursue an artistic life. I might have had a certain talent, but it wasn’t something that anyone encouraged me to pursue as a career. SD: Then you went on to Parsons and Yale and received formal training as an artist, and soon after you graduated, you began showing in New York City, which has always been a big deal. Who were your mentors or influencers during your formative period? BT: I think the most influential professor for me was Ronald Jones. He is both a critic and an artist, but he’s also had a very politically charged agenda. So it was very easy for me to talk with him about some of the ideas about politics that I might have had in my head, because his work was so politically driven. It made the transition from a political to an arts education very-very smooth, and he supported that approach. The Yale program in sculpture is very small – only eight students graduate in any given class. And the way the program is set up is that it invites many artists, and critics, and curators, and in some cases art dealers, to teach seminars and meet with us in the studio. So we had a very rich and very fluid education. SD: Have you always been interested in history? Somehow history seems to be playing a role in what you do as an artist. BT: Yes. Very much so. I grew up in a place called Glen Cove in Long Island, a town established in 1668. So there were a lot of historic buildings in that town; I was the youngest member of the local Historical Society. I’ve always been interested in how history is represented, how it’s repositioned. I’m interested more in the mechanics of it than its specifics. How do we see things at different times? How do our opinions change over time? SD: I read somewhere that when you were building the Irish Hunger Memorial you were looking to represent a variety of viewpoints, but none of them taking a central or a predominant role compared to the others. SD: Maybe now it’s the time to talk about the materials that you use in your work. I know that you approach each project differently, and you say you don’t have a style. You used stones for the Irish Hunger Memorial, Styrofoam for the Witch Catcher, and acrylic for the project at the Manhattan Bridge. Sometimes you use plaster. Let’s talk about the thought process that you go through when you’re about to begin a new project, your technique, and also the tools and materials that you have in your studio. BT: Every project, whether be for a public venue or for a museum or a gallery starts the same way, with intensive research. In the case of the Irish Hunger Memorial obviously the subject was provided. For that particular project I went to Ireland, and spent weeks there meeting with historians, visiting historical sites, trying to get a sense of what had happened there in the 1840s – 1850s. I entered into this research without any expectations about what might come out at the other end. So it’s not like I’m trying to use research to prove my thesis. It has more to do with a process of fortification, or enrichment that puts me in a position where ideas begin to gel, and I’m in a position to do something about it. SD: Is it just about discovering and sharing, or also about renewing interest in certain topics? BT: At this point in my career often times we’re invited without a proposal. The invitation is based on qualifications. It’s interesting, because we – I say we because I work with my partner Brian Clyne, who runs the studio – and I speak in the we because the scope and the scale of the projects that I do, even the projects that I do for galleries and museums, require the talents of many people, particularly the public projects, which in the case of the Irish Hunger Memorial, is a half of acre sculpture. So the invitation is based on qualifications. And what that does is that it frees us to really explore the possibilities and the meanings of a particular place. You never know where you’re going to land. In the last year we’ve made projects in Calgary, Alberta, Canada, at the University of Houston in Texas, and we’re about to install a permanent work at the entrance of the Manhattan Bridge into Brooklyn. So, these are three entirely different venues, with very-very distinct histories. SD: You once said that the “materials must serve the work.” Talk about your conceptual approach. BT: If there is a signature or fingerprint in the work is a conceptual one. It has much more to do with how I approach a subject and less to do with how I represent the subject. In the case of the Irish Hunger Memorial, we’re talking about a sculpture that occupies a half of acre of land, and is at the scale and scope that requires architects, structural engineers, landscape architects, lighting designers, graphic designers – it’s a sculpture on scale with the building. That had a very specific requirement. The work that I did for Levittown required that I built a perfect model of the original Levittown house, but then we chose to execute them in platinum silicon rubber, because I wanted them to have a kind of flexibility, and mutability that the originals obviously didn’t have. We really do have to stay flexible and open to the possibilities of the materials that best serve the concept. SD: In 2002 you exhibited at the Whitney Biennial. Talk about that. BT: I was installing that work for the Whitney Biennial while I was building the Irish Hunger Memorial. I spent my time both uptown and downtown. The Whitney collaborated with the Public Art Fund to install five projects within Central Park – it was in conjunction with the museum’s exhibition, but it was outside in the park. This was a groundbreaking exhibition to the extent that the Central Park Conservancy had always upheld Frederick Law Olmsted, the designer of the park’s belief that the park was in and of itself a work of art, and didn’t want art occupying the space of the park. I took on Olmsted’s idea and decided I didn’t want to install a discrete object in the park, but rather to work with nature. I was thinking about that kind of subtle disruption that could happen. I chose to install 75 pumps below the surface of the great lake near the Boathouse and the Bow Bridge that were controlled by a computer, to simulate flashes. Those flashes were programmed by me at different times during the exhibition, and they were in some cases very-very subtle like one splash, two splashes, three splashes in a row, and they’d give the impression maybe of a fish jumping, or a frog lipping, or a stone skipping. And then occasionally they’d do something maybe less benign – all of the fountains would go out simultaneously – in a kind of explosion of water. It was like testing the expression of water. SD: It’s been said about your work that it has to do more with simulation than representation. I think these splashes can still be seen online whether looking through Google Images or perhaps on your website at briantollestudio.com. Watching those images makes one wonder, was it a fish or was it Brian Tolle playing with water? BT: Right. That was the whole point. Going back to the Irish Hunger Memorial, it became very clear to me when I became a finalist for the project, that what I was asked to do might actually be considered historical, and that made me very-very anxious. One of the requirements of the Memorial Committee was to create places for historical inscriptions. It’s one thing for an artist to do work that looks historical or create some sort of historical residence within the space of a museum or gallery, because people understand that is art. It’s a very different thing to be asked to organize the history of these traumatic events, the events of the famine. I did not want to officiate over that, and I certainly did not want to have the last word. There are two miles of information on the base of the Irish Hunger Memorial. All of it is in the form of lighting shadow. The text is lit from behind, and the shadow is cast on glass. So what that did was that it allowed for me to provide the space for not only a lot of information, but also information that can be easily changed and updated over time relatively inexpensively – the texts are not arranged in a chronological or categorical way. I wanted the experience to be more of a cacophony. So if you approached the Memorial on one day and happened to read a Quaker soup recipe that was used to help starving people in Ireland in 1847, or statistics about the amount of dog food consumed in the United States, that textural engagement might shape your visceral experience as you move through the monument itself. SD: I understand that. To me just presenting something in a strictly chronological order has the tendency to a certain extent to become boring. By contrast, when you’re taken by surprise, I think you’re more excited about the experience. Just this year in 2015 you completed two major projects: Outflow in Calgary, Canada, and Origin at the University of Houston in Texas. Let’s talk about these two projects. BT: I’ve been working up in Calgary for about eight years now developing this project. The City of Calgary’s interest as it related to me was in relationship to their water, drinking water in particular. Calgary is one of the major metropolitan areas that drinks directly from their river. The source of that water is the Bow Glacier in the Canadian Rockies. I spent a lot of time visiting the Rockies, and talking with the people who run the water system. They explained to me various processes that they used to maintain the cleanliness of the water, and how they tried to educate the public. One of the ways that they were thinking about raising public awareness with regard to the water source was to daylight existing outflows. An outflow is basically a storm sewer. In this case they were built in the 1950s, and they’re invisible. Daylighting made it very visible to the public where the water goes. But also by opening up the pipe, certain valval chemicals can gas off before they get to the river. And because of the nature of my sculpture, which is an inverted mountain range, very close to the source of the water, as the water runs through, solid polluters actually collect in the sculpture. In some ways it’s counterintuitive to think of a sculpture of being designed to collect trash before it goes into the river. Part of the mission of the project is to let people understand what’s going on; my mandate is to let the trash accumulate to the point when it needs to be removed. SD: In this case your sculpture plays a role both aesthetic and functional. How big is the structure? BT: It’s about 70 feet in one direction, and 35 feet in the other. It’s about 15 feet deep. We used digital topographs from the National Geographic Survey, so we had an actual 3D model of the mountain range. We carved the molds in foam, then poured in a very specialized concrete called ductal, which is manufactured in Calgary. We try to as best as we can to work locally. Of the total amount the city spent on this project, I would say about 80 percent went back to the city itself. We hired local manufacturers. The city hired a local architect Marc Boutin and his Collaborative to design a parkscape that supports the project. It’s been completely integrated into their park system. SD: How did you achieve this incredible texture? BT: That was the hardest thing, frankly. 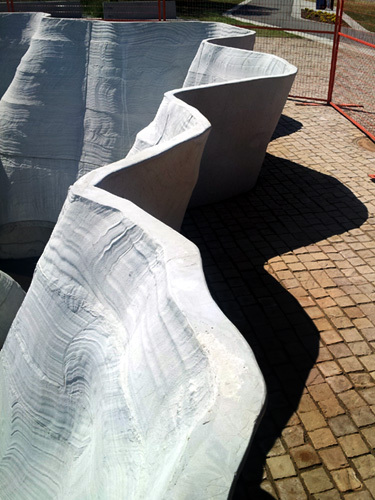 Here’s we were working with this concrete that is used to make overpasses, and train stations, and this is the first time it’s ever been used for a sculptural project of this scale. It behaves very differently from other concretes: when it’s first mixed it has the consistency of whipped cream. How to make the mold was a big issue. What we ended up doing was getting these enormous blocks of foam, 8 foot by 4 foot by 4 foot. What the fabricator did was to draw the plan of the top of the panel, and the plan of the bottom of the panel on either side of this gigantic block. And then I made a hot wire, and made all kinds of bents in this piece of wire, and then two people pulled this wire through the giant block of foam directed by a third person who would call a number, and they created this texture. The beauty of the texture is the fact that it’s an actual record of the physical effort that went into producing the molds themselves. If it is to describe its color, I’d say it looks like unglazed porcelain. SD: Another project that you completed this year is called Origin; it’s at the University of Houston in Texas. Let’s talk about this project. And why this name? Did you pick the name? BT: Yes. The title for me is the most difficult thing. I can’t explain why that is, but often times that’s the last thing. It frustrates a lot of clients. In the case of Houston, I got very involved in the history of the place. One of the things that existed when I went to the site was a lecture hall for the business school which had a very-very large scupper on the roof of the building; the arts administrator asked me not to pay too much attention to it, because it was so unattractive. At the same time, one of the people who was funding the project was very keen of me producing a fountain. I did my research, and learned that Houston does have significant, concentrated rainfalls certain times of the year, but then they have very dry seasons. There is a real water conservation issue in Texas, and in Houston in particular. It seemed to me irresponsible to create a mechanical fountain where water would be wasted. The combination of this run-off water from the roof, and the scupper seemed to me like we could have a passive water feature that happens when the rain falls. That got me thinking about creation myths. There was a tribe of Native people, Karankawa, now extinct – they vanished in the 1820s; they would go to Galveston, and actually Houston was closer to the water than it is today. There were huge oyster mountains from that period, going back thousands of years, when the Natives would cast off shells. And, there was this beautiful pile of shells that I was looking at; the Karankawa had this beautiful creation myth that the first of their people lived in a giant oyster shell in the sky. The child was born as the son of the moon. And the son of the moon cradled, and rocked the cradle, and fell to earth, becoming the first Karankawa. The moon was so distressed by what happened that she would periodically cry, and create these incredible thunderstorms that are part of the Houston experience. I thought that was such a beautiful myth, and that was the answer. I created this giant oyster shell that replaced the scupper. 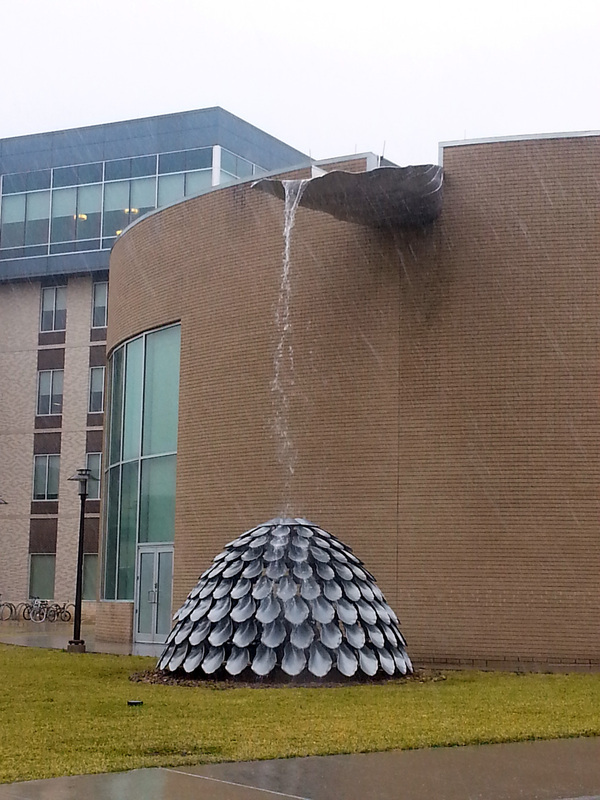 When it rains, the water cascades onto a pile made of hundreds of cast aluminum shells, and the sculpture becomes active when the rain is happening. So, there is a water feature at the University of Houston, it’s just not mechanical, it happens naturally. I should mention in this case, as much as I like to work with local crafts people – the foundation was done by Houston people, but the actual sculpture itself was fabricated in Saugerties by Scott Kolb, the son of pianist Justin Kolb. SD: You always want to understand first the local scene, then come up with a concept that tells a story. In the case of the University of Houston, when people walk on campus and see this giant oyster shell, they have to think there is a story behind it. Now let’s talk about the Manhattan Bridge project, which will be completed in a couple of weeks. BT: It’s eight years in the making. If any of you have been on the Brooklyn side of the Manhattan Bridge, until very recently it was a very chaotic spot. About ten years ago the City decided to create a green belt across Flatbush Avenue, and created more order there. I was the first to be commissioned to make what we hope to be a series of sculptures that will be introduced along the Avenue in future years. As part of my research, I wanted to understand why it was that on the Manhattan side of the very same bridge there is a more elegant entry, while on the Brooklyn side there was this no man’s land. As it turned out, it wasn’t always the case. There once was a very grand entrance, so grand in fact that included two sculptures, two allegories by Daniel Chester French, who some of you may know sculpted Lincoln for the Lincoln Memorial, among other noteworthy sculptures. Those two sculptures were removed, and brought to the Brooklyn Museum when Robert Moses, the great power broker, was planning the trans-Manhattan expressway, which would have destroyed what we know as the SoHo neighborhood. On the Manhattan side the historical preservationists were far more organized, and they prevented that from happening there, but on the Brooklyn side they weren’t so organized, and Moses went away, and destroyed this grand plaza. And then the project was halted, and we were left with this mess. In the 1960s Moses saw history and art as an obstruction to progress. And here in the 21st century I am being asked to enhance the neighborhood by bringing art there. It made perfect sense to me that we bring the two ladies back. The two sculptures that Chester French sculpted for the bridge are allegories: one represents Miss Brooklyn, and the other one represents Miss Manhattan. They currently sit on the façade of the Brooklyn Museum which cooperated greatly with us to make this project happen. So I’ve re-created the two sculptures, cast in a beautiful translucent, white acrylic. I’ve set them on top of a pedestal that is 26 feet high – the design is inspired by the footing of the Manhattan Bridge. In fact the base is being painted Manhattan Bridge blue, to make the connection back to the bridge. The two sculptures sit on top of this pedestal, very close together. Miss Manhattan and Miss Brooklyn will dance over Flatbush Avenue because the two figures actually rotate, and they can survey their surrounding area, and gaze into each other’s eyes periodically. And they’re lit at night. I have to say, this entire project is made by crafts people in New York City. SD: Do you ordinarily work with many crafters to help you materialize your ideas? Is it you who decides what materials should be used, and how to be used? Do you have lots of engaging conversations with the crafters to see your work completed the way you envision it? I know you don’t start a new project with preconceived ideas, but how does it work? BT: I know what I’m looking for when I see it, but I rely on people who are spending a lot of their time doing certain things, like this man Ovidiu at Colbar – he’s the most remarkable craftsperson, and he’s committed his life to making beautiful things. Once I see the material, I open up to learning more about the material, what its capabilities are, what the possibilities are. So, it’s part of this fortification process where the craftsperson is actually teaching me something. The biggest mistake an artist can make is to force people to make something they may know it’s not going to be optimal. My position has always been “speak to the people who know better, let them show you what they can do.” Every instance the project is better than if I had gone ahead with what I thought I had wanted. SD: When we allow ourselves this kind of freedom, we discover things we couldn’t have imagined before. BT: Precisely. We make changes until the very end, which is a little nerve-racking for the clients. SD: You’ve created quite a few public art projects as well as museum and gallery pieces. Do private collectors also come to you, and commission you to design projects just for them? BT: I’m very fortunate that I have a very loyal collector base. This handful of collectors have been following me around for over twenty-five years, and they’ve always been supportive. I haven’t done a commission in a private residency, but I did a commission for the New School, which Parsons is part of. I did a sculpture for the President’s private reception which was installed a while ago. I’ve recently been asked to consider designing an office suite for a company, which is an interesting proposition, because often times art consultants are hired to select tasteful, interesting works. In this case the consultant came up with the idea of having one artist design all of the works for the office. SD: You explained that each project is different: the University of Houston invited you directly to submit a proposal. In the case of the Manhattan Bridge project, there was a competition, and you won that competition. How do you feel about showing in public spaces as opposed to galleries and museums? BT: It’s very different. I teach a course at Parsons on public art. We go through the different art movements, let’s say from the 1960s onward when artists who have influenced me like Agnes Denes and Robert Smithson were making art in public spaces by choice. These are people who rejected the gallery system, because they understood that it was commercially driven and in some cases limiting. I came out of school after the economy had collapsed in the late 1980s and well into the 1990s, and graduating even from a place as prestigious as Yale in 1994 there wasn’t a whole lot of hope to get gallery representation. There wasn’t something that we expected. I guess the difference is that when you show in a museum or gallery you have a captive audience – you have people who frequent these places, you have a collector base who supports these places. There is no way of controlling, nor would you want to control the audience in a public space, so you never know who is going to come across a project, and how they might respond to it. In the case of the Irish Hunger Memorial, it’s been a privilege that so many important writers of our time have written about, Simon Schama wrote a piece for The New Yorker magazine, Roberta Smith did a wonderful piece for The New York Times, but Verlyn Klinkenborg, who is on the editorial board of the Times, wrote a beautiful piece, and the most resonant thing he said was that the power of the Irish Hunger Memorial is that it trusts the intelligence of its audience. SD: Currently on view at the Museum of Art at SUNY Albany there is a retrospective show called “Bordering Utopia: Sculptures by Brian Tolle.” Let’s talk about this show, which will remain on view through December 12 this year. How many works are included in this exhibition? BT: Corinna Ripps Schaming, the curator of the museum, has been incredibly committed to understanding my twenty year career. We found works that were with collectors in different parts of the country. We even borrowed a beautiful piece from the Tang Museum. I would say there are about two dozen pieces in this show. SD: What are some of the pieces exhibited there? BT: The earlier pieces that I made were made of Styrofoam, a material relatively inexpensive. I could achieve a certain scale. One of the nice things that happened with this show has to do with my first show, which included Colonial American frames and windows, and these enormous beams. When Corinna came to the studio about two years ago to talk about the exhibition she fell in love with these beams. And we brought them to the museum in Albany, without any idea of how they might be displayed. It became very clear that they would be this sort of relief sculpture, no longer a sculptural object, but a sculpture that could really be appreciated in relief. For the first time the public is being given the opportunity to appreciate the carving of the beams. It’s completely hand-carved by me. SD: Another piece included in this show is Witch Catcher, a giant chimney made out of Styrofoam as well. BT: There have been three Witch Catchers. The first one I produced is the one that’s at SUNY Albany now. Going back to my thirty year old self, I literally cut off about 2,000 Styrofoam bricks and then stacked them as a child would stack them to create a spiral. I would stack them over and over to push them as far as I could. When I finally got to the point when they fell over, I knew that that was the limit of how far I can twist it. There were basically 2,000 Styrofoam bricks that were glued together, and painted. SD: Let’s talk about the Levittown project. BT: Levittown was built as a post-war development: William Levitt built 17,500 houses in the potatoes fields in Long Island. There is often a political subtext in many of the projects that I’ve done. In the case of Levitt, one of the things that intrigued me was this classic Cape Cod house that he replicated 17,000 times. Of the 17,000 houses only a handful of them still maintain their original form. I realized that this image of the Cape Cod house was vanishing rapidly, so I made a model out of wood about the scale of a dog house. I actually went out to Levittown and knocked on people’s doors, saying “you got an original door knob, do you mind if I measure and take pictures of it?” Someone gave me an original asbestos shingle that they had in their garage. So we pieced together a house that does no longer exists. We cast twenty of these houses using platinum silicon rubber, so it’s very flexible. The idea was to stretch the house over objects that might have been associated with that period. The installation explores the image that most of us would associate with the 1940s and ‘50s. SD: Looking back at your career, what do you think has changed after all these years? BT: It’s very difficult to predict where a career might go. I was somebody who made objects, made things by hand, I made them myself, I didn’t rely on other people to make them. I worked with very limited means. As I’ve gotten more and more involved in public art projects, I became more reliant on other people to provide me with services to build things. And things became more and more abstract. The piece that is being loaned by the Tang Museum was donated. The piece was never taken out of the crate: the collector never installed the piece; he had wanted to, but never got around to it. The piece had remained in the crate since it was purchased in the 1990s. We got to look at this piece for the first time since it was made. It’s twenty years old, and it’s made of Styrofoam, it began to shift a little bit, nothing extreme, but enough that I had to make some repairs. Going through the sculpture and trying to re-think “how did I do that?” Not that it was complicated at all, it was the opposite, but I had to re-think how things were made, I had to re-think how things were painted, and it’s actually been an eye-opening experience for me because my career is growing in such a way that I don’t have the opportunity to make things in the way that I once did. And I really do think that I want to go back to that hands-on approach. It’s something very liberating about being able to put some things together and make meaning out of them. SD: Talk a little about your studio here in Roxbury. It’s one of the most prominent edifices as you come into town going north. BT: When I got out of grad school, I rented a 2,000 square foot store front in Williamsburg. I actually shared the space with a classmate of mine. Two years ago when my lease expired, the rent increased tenfold. Growing up on Long Island, I was drawn to something different, I was always drawn to the mountains. 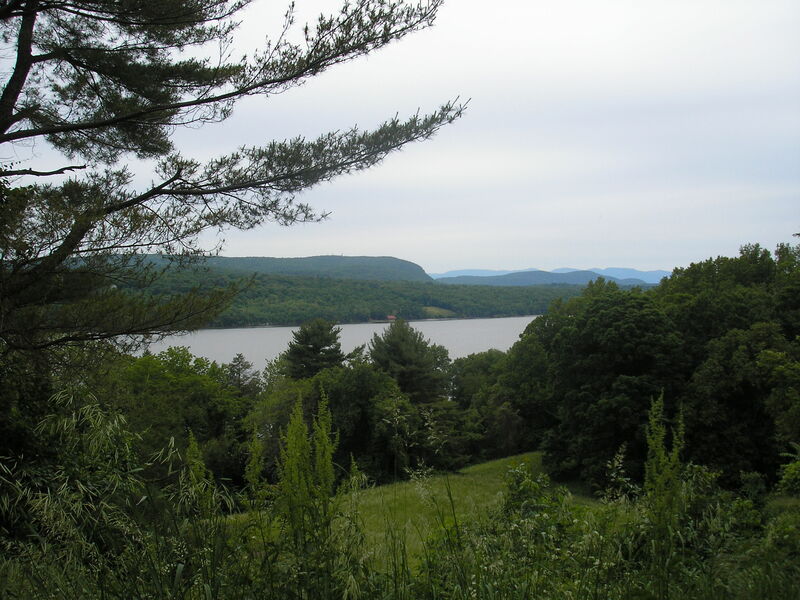 Many years ago my partner Brian and I spent a summer traveling through the Catskills, and settled in this area. We bought a small house outside of Fleischmanns. My dad drove past here in Roxbury, and said “you know, there’s a church for sale; I don’t know if you can afford it, I don’t know how much a church cost, but you might want to look at it.” When I drove up to it, I was so pleased with the humble nature of the building. When you think of a Catholic church, you think of a much more elaborate edifice. This one was such a modest building, but very-very beautifully built. The church was erected in 1925. We bought it intact. This was the perfect place for us to work. We needed the open space, we needed the height, it’s in the village, it’s very convenient for us. The quality of the building supports the kind of work that we do here. Because we’re very-very meticulous in what we do. There are twenty-six stained glass windows in the building. Five of them are visible from the façade, but not from the interior. And I opened up for the first time in the history of this church one of these windows; I intend to do the same with the rest of them. Our priority up until this point was to develop the interior of the building. We’re committed to preserving its historical value. SD: What is your next project? BT: I travel quite a bit, developing projects. My next exhibition will be at the Pennsylvania Academy of Fine Arts in Philadelphia in June 2016. That particular work for example is called “Commander in Chief” – it’s all about American presidents. Seven years ago I spent a summer reading every presidential inaugural address, and responded through sculpture. The Pennsylvania Academy has an extraordinary collection of Americana, historical portraiture and sculpture, so I’m going to inject my sculptures into the collection, in conversation with historical objects.